Find out what our experts have to say about Hero Splendor Pro! The least priced variant is Hero Splendor Pro Kick Alloy priced at Rs. 57,276 and the most priced variant is Hero Splendor Pro Self Alloy priced at Rs. 60,855. Choose the Hero Splendor Pro which fits the bill of you. Hero Splendor Pro was launched in India in the year 2011 after the blockbuster success of the Splendor Plus. The bike gets a touch of style and targets the customers who want modern looks while not compromising with the Splendor brand name. The Splendor Pro registers some decent sales numbers and contributes significantly in making the Splendor the best selling motorcycle in India. The bike comes with the updated version of the tested 97.2cc, single cylinder engine that powered many generations of the iconic Splendor. Prime features of Hero’s popular commuter include electric start, side stand indicator, an optional luggage carrier and more. All thanks to the appealing body styling and the addition of a number of interesting and useful features, the Splendor Pro has been a hit in the market even today after seven years of its inception in the Indian market. The Hero Splendor Pro can be currently yours in India for a starting price of Rs 49,598 and if you wish to go for the electric start variant, you will have to spend Rs 51,476 (both prices being, ex-showroom, Delhi). The motorcycle challenges the likes of the TVS Radeon, Bajaj Platina and Honda CD 110 Dream in the segment and offers great value for money at this price point. Hero Splendor Pro looks more stylish than the standard Splendor Plus in order to offer something more to the customers in terms of visuals. The motorcycle gets a curvy headlamp up front while the side panels and the fuel tank gets some sharp edges that make the overall design a bit sharp and appealing. As a cherry on top, the Hero Splendor Pro gets attractive graphics that suit the overall design and styling. The instrument cluster of the motorcycle looks fancy and has three sections with a chrome outline. While the centre portion houses a speedometer, the left and right ones get telltale lights and fuel gauge respectively. The Hero Splendor Pro has overall body dimensions of 1970mm x 720mm x 1040mm (LXWxH) and the respective wheelbase and ground clearance figures account at 1230mm and 159mm. Overall, the motorcycle looks quite proportionate and is a good option for those who find the Splendor Plus boring and outdated but still want a Splendor with a similar price and features. 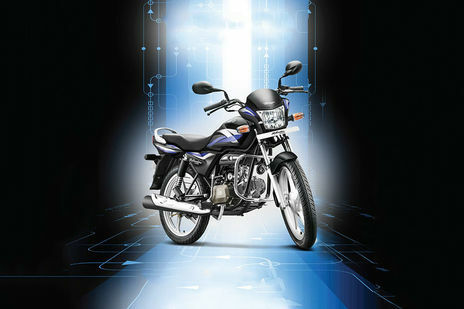 Powering the Hero Splendor Pro is a 97.2cc, air-cooled, single cylinder engine that is mated to a four-speed gearbox. The engine develops a maximum power output of 8.36PS while the peak torque is rated at 8.05Nm. With this engine, the bike can touch a top speed of 87kmph as claimed by the manufacturer. The engine gets an easy electric start to offer convenience to the rider. As far as fuel efficiency goes, the Splendor Pro should offer you a combined figure of close to 65 to 70kmpl. All thanks to the 11-litre fuel tank, the motorcycle will deliver a total range of close to 700 kilometres once you go for a full top up. The engine is smooth and refined that contributes to making your daily rides hassle-free. The Hero Splendor Pro gets its braking done with the help of a 130mm drum brake up front along with a 110mm drum brake at the rear. The brakes work decently and will not disappoint you in day to day commutes. The suspension system of the motorcycle includes conventional telescopic forks up front while the rear has been equipped with twin spring five-step adjustable shock absorbers. The bike sits on a tubular double cradle frame and is easy to handle and manoeuvre in city traffic, thereby making your daily commutes easy. The motorcycle has a total kerb weight of 112 kilograms and hence, almost anyone can ride it without any difficulty. The Hero Splendor Pro rides on 2.75x18-42P / 4PR front and 2.75x18-48P / 6PR rear tyres that offer a decent grip. In terms of safety, the Hero Splendor Pro gets a side stand indicator that keeps the rider alert. The motorcycle also gets AHO (Automatic Headlamp ON) facility under which the headlight of the vehicle stays always ON in order to enhance its visibility, thereby minimizing chances of a mishap. The Splendor Pro gets an optional rear luggage carrier that offers convenience to the rural customers. Furthermore, the bike has an easy electric start that makes things easy for the rider. In terms of styling, the bike gets clear lens turning winkers and chrome finished exhaust muffler that make the bike look premium and upmarket, which is good for a 100cc commuter.